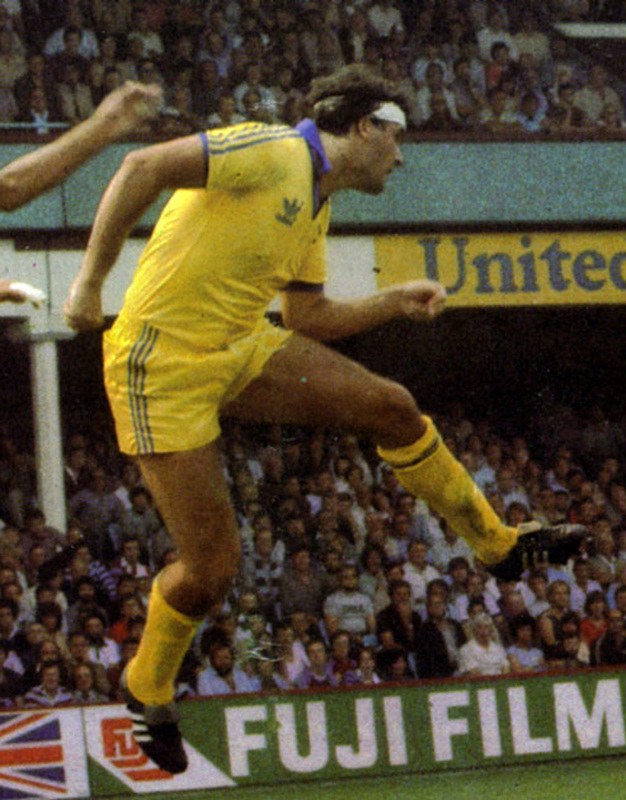 Strangely, when Adidas took over the contract to supply the Brighton kit from the 1980/81 season onwards, they did not sell replicas of the yellow away kit. Although the collar was not as flared as the original, it was a pretty faithful rendition. The most glaring error is that it was ‘British Caledonian Airways’ for the change shirt, not just ‘British Caledonian’. If you want to be extra picky, the type of the sponsors’ logo was also not in bold, which is how it was in the Thai version. A good effort, nevertheless. 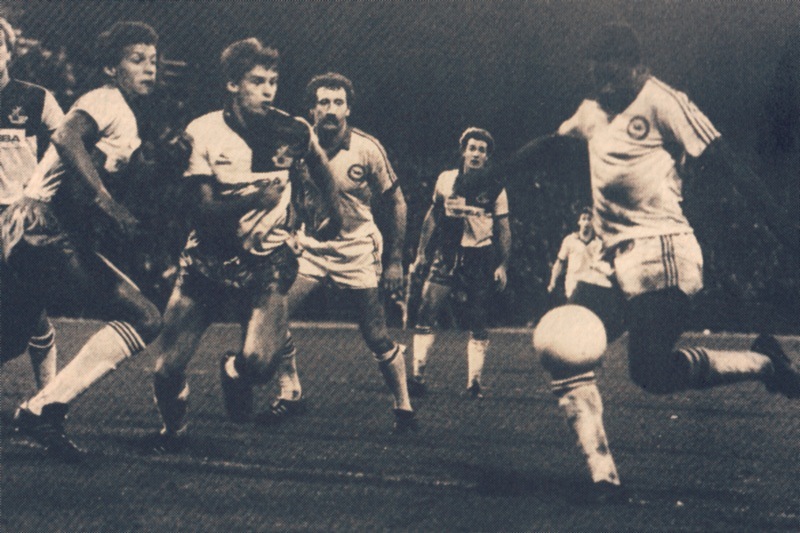 There was controversy before the match when ATV, the Midlands ITV company, wanted to film the game, to show highlights the following evening in a two-minute news sequence. The Albion were however clad in the yellow ‘British Caledonian’ shirts and after a ‘phone call between Alan Mullery and Gary Newbon, the TV presenter, it was clear that the game could to be shown. Albion were well within their rights to refuse to change, other than for a featured game and ATV felt that the regulations would not allow the showing. However, it got its best exposure at the FA Cup Semi-Final between Brighton and Sheffield Wednesday. It even outlasted the home version, as it was worn for a few matches in the 1983/84 when the new white away kit did not provide enough contrast at the likes of Bristol Rovers and Blackburn. It was also the kit when Brighton won 1-0 at Selhurst Park in September 1975, thanks to Barry Butlin’s goal. 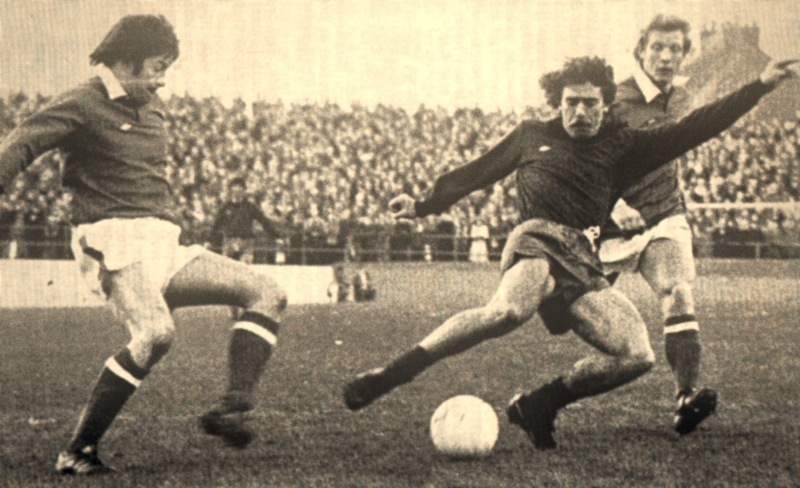 Peter O’Sullivan in action against Gillingham but it is Gerry Fell that gets the only goal. I’m not sure if Albion players found it hard to spot each other when playing on a plush grassy field (surely a rarity in the Third Division in those days? 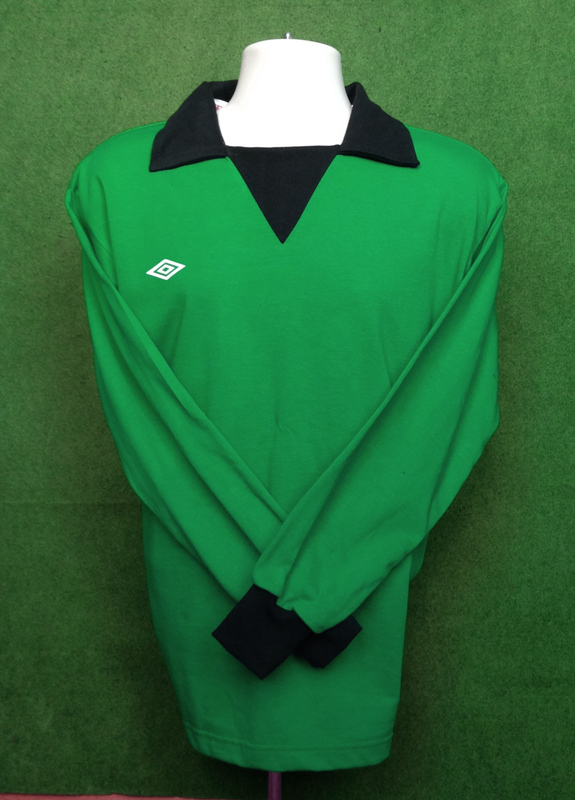 ), but the green Umbro shirts gave way to some red ones at the start of the following campaign. 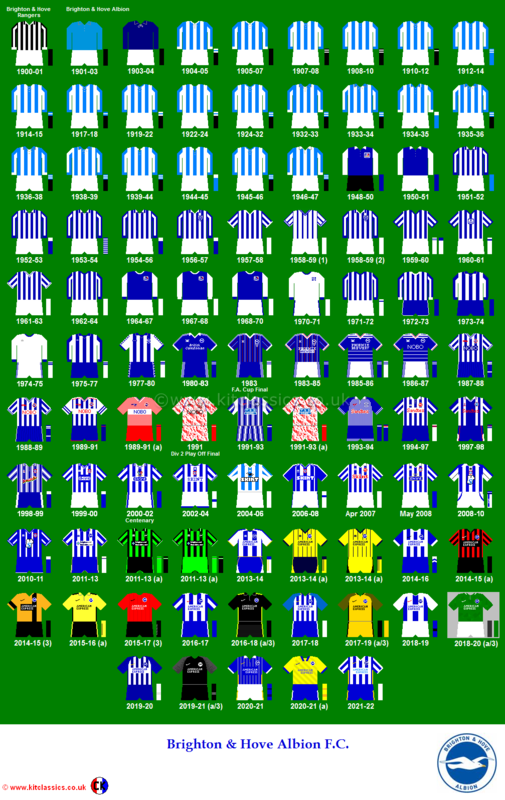 Its most famous appearance came in the 1983 FA Cup Semi-Final when Brighton beat Sheffield Wednesday 2-1. 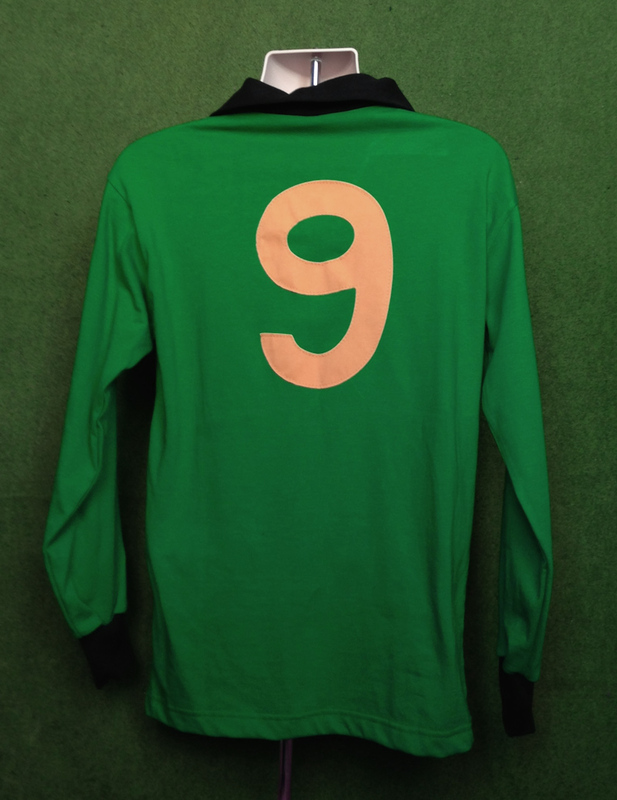 What is forgotten is that it was worn several times for the following season, 1983/84. You can also see this adidas shirt in more detail at Phil Shelley’s Old Football Shirts website. 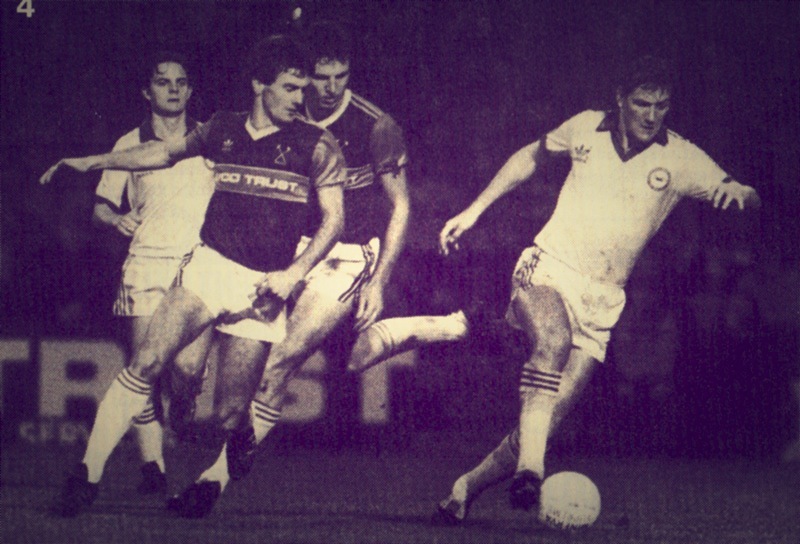 However, there was a sartorially tricky League fixture in the 1983/84 campaign at Blackburn Rovers, and a cup tie at Bristol Rovers (Milk Cup) that meant both the blue home shirt and the white away top could not be used as change kit. Fast forward three more seasons, to 1987/88, Spall took over the supply of Albion’s playing and replica kit, introducing a snazzy yellow shirt with shadow stripes. It was the first yellow away shirt worn in a promotion season since the Bukta design under Alan Mullery all those years ago. 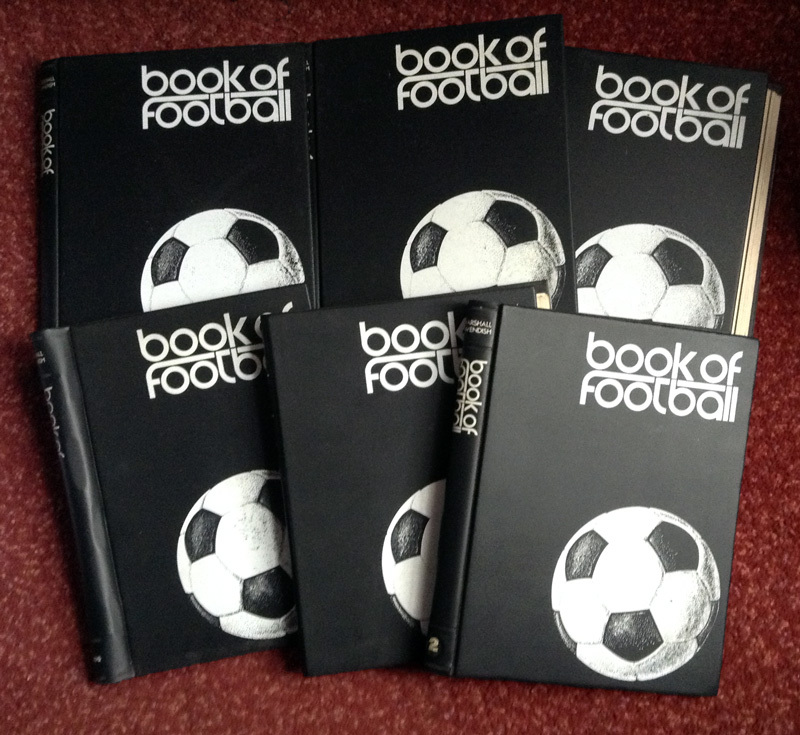 As covered in a previous post about the life and times of Norman Gall, the Book of Football was a weekly partwork from the early 1970s, building up to an authoritative encyclopaedia of the game over the course of 75 weeks. I bet, if you around then and had collected every issue over a year and half, you’d quite rightly have been very satisfied with yourself. 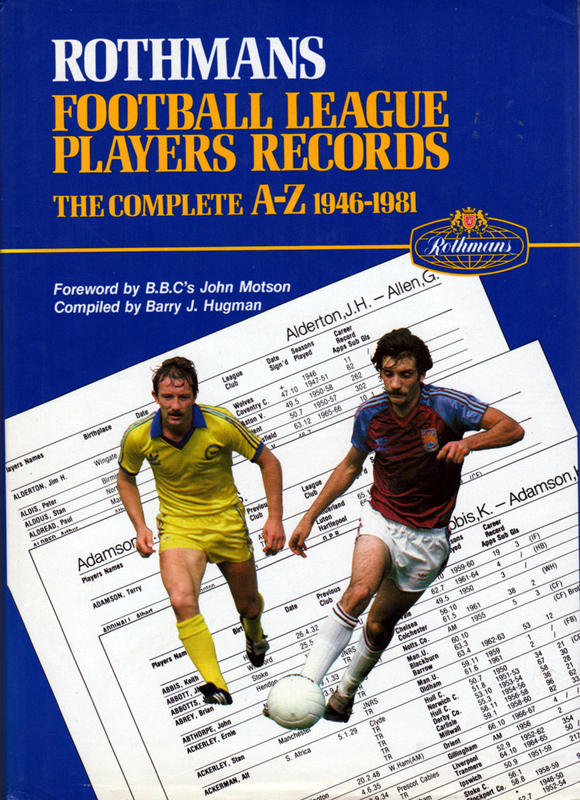 And wouldn’t think anything of it as you proceeded to bring all six volumes down the pub and proceeded to bore your friends with your newly acquired knowledge on football tactics, club histories and goalscoring feats…! 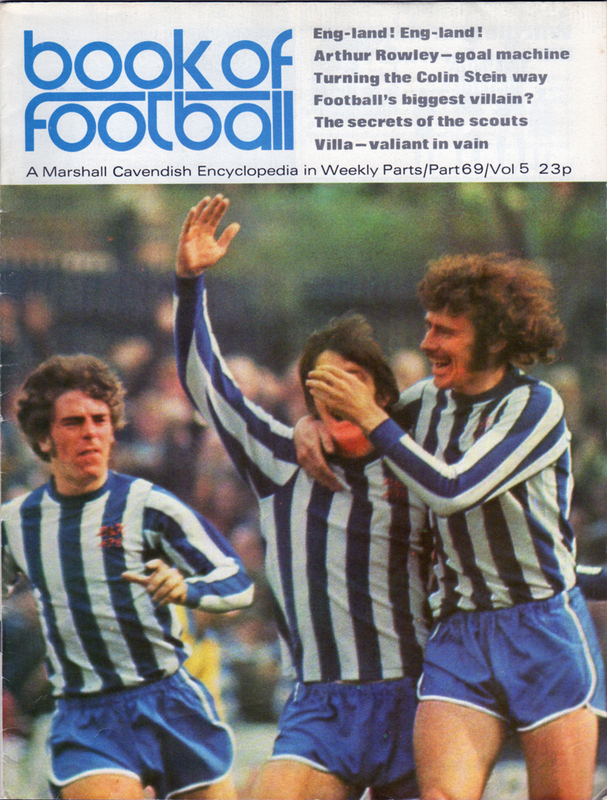 Nearing the end of the completion of Marshall Cavendish’s series, came Part 69 which featured Peter O’Sullivan, Willie Irvine (face partially concealed) and Kit Napier, three happy men in their running shorts, celebrating an astonishing team-goal in March 1972. One of the highlights of the 1971-72 season for Brighton. Kit Napier congratulates Willie Irvine after his goal which gave Brighton the lead in the vital promotion match against Aston Villa. Brighton won 2-1 and Irvine’s fine goal was featured on Match of the Day. And what a diamond of a goal it was! 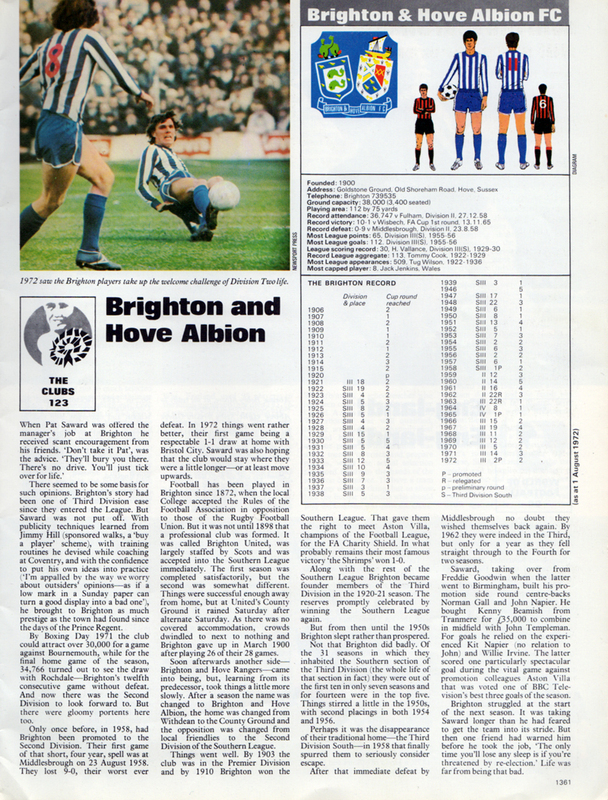 Inside we are treated to another colour photo (of Kit Napier, number 8, and Ken Beamish, on the floor) plus a potted history of Brighton & Hove Albion. Written very concisely, it charts a local Brighton college’s acceptance of the Rules of Association Football in 1872 (yes, the dark ages before Brighton & Hove Albion were formed), through to the creation of the club, the Southern League days, Brighton winning the Charity Shield (also against Villa), through to victory in Division Three (South) in 1958, to Pat Saward’s then current struggles as his charges flopped in the early months of Second Division football in 1972/73. There are also some excellent illustrations of the coat of arms the club used in the 1960s and early 1970s, as well as some mostly accurate drawings of the home and away kit (persnickety alert: the only omissions were the red lettering on the home shirt and some white hoops from the away socks). Together with Brighton’s season-by-season record in the League and FA Cup, it all makes for a splendid portrayal of what the Albion was like back then and its relative stature to other club within the football world. And if you want more, there’s all the other 74 parts you can read too! 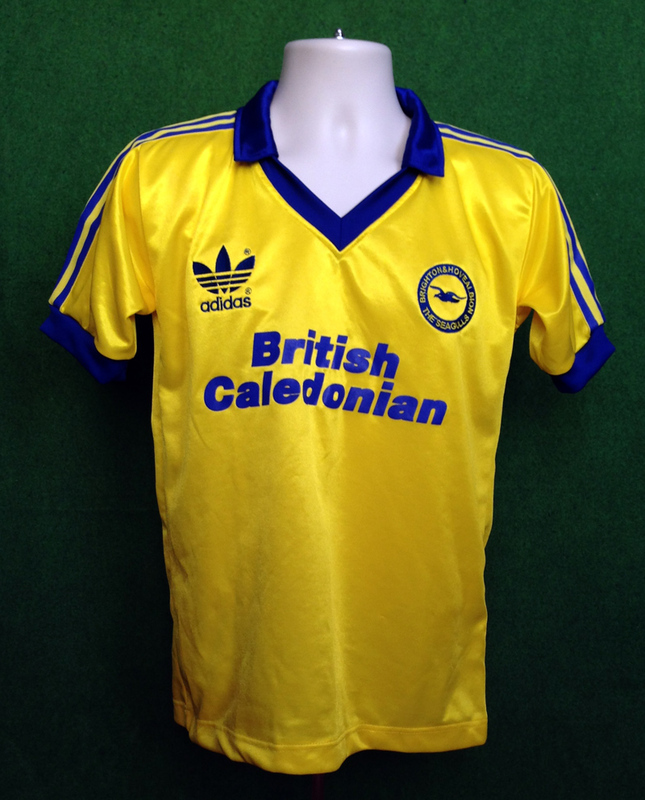 Worn in the famous snowy away tie in the FA Cup against Peterborough in February 1986, this striking kit is fondly remembered by Brighton fans of that time. It had three large bold horizontal stripes on the side of the collar, a design that was unique to us despite all the other clubs that adidas manufactured shirts for at the time. 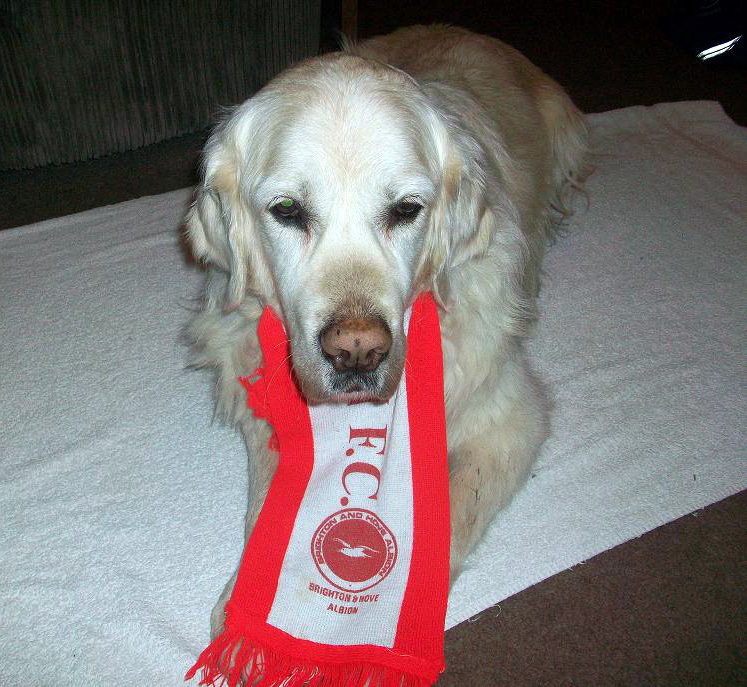 … although with Stat Brother’s six month old golden retriever Lionel around, it may not last forever! A season later, NOBO replaced Phoenix Brewery as the sponsor for the Albion shirt. It has not been often in modern times that a player has served Albion continuously for ten years – Steve did so in defence or midfield and battled back from a bad pelvic injury to play again when many might have thrown in the towel. He was, indeed, a versatile player but he never scored an FA Cup goal for Albion – in fact, he once played for much of a League Cup match in goal when, at the City Ground, he replaced the injured Perry Digweed between the posts for Albion and he didn’t do at all badly.